Like several prominent Australian boat manufacturers, Bar Crusher offers several of its larger hulls with the hard top alternative. In a marine environment as harsh and often unpredictable as ours, there’s simply nothing like a well-designed hard top to provide the ultimate in user comfort. Whether it’s cold and wet in Tasmania or hot and oppressive in Queensland, you just can’t beat sitting at the helm with a decent roof over your head. I’ve driven all of Bar Crusher’s hard top (HT) models, with the 780HT my personal favourite. However, in a slightly smaller package it’s hard to go past the Bar Crusher 730HT – a rig that can take you wide in a hurry and get you back again in comfort and safety. This is indeed a handy-sized outfit, and one that’s creating a lot of new interest for the Melbourne-based manufacturer. I first saw the Bar Crusher 730HT at the Adelaide Boat Show in June, where it took pride of place on the Pacific Marine display. Immediately noticeable as I moved in for a closer look was the pair of 130hp Evinrude E-TECs hanging off the back. I had only seen one Bar Crusher with twin outboard engines before – a 780HT with dual 150hp four-stroke outboards. I couldn’t wait to get into this new unit to see if much lighter two-stroke engines were a good fit. Regular visitors to BoatAdvice may recall my recent field test on the Bar Crusher 730C, which is quite a different boat to its hard top sister. The ‘C’ version offers a truly enormous cockpit, relatively compact helm area and limited cuddy accommodation up front. At the other end of the spectrum, the 730HT provides a smaller cockpit, a much more comfortable helm and a bit of extra room in the cabin for overnighting. All of these adjustments mean different weight distribution, which I found to be extremely significant. Nothing changes in the HT models once you look beneath the cockpit floor. The sub-deck water ballast chamber, which runs from the transom forward, is the primary reason Bar Crusher can build such a radical vee into its hulls and get away with it. For those unfamiliar with Bar Crusher’s Quickflow® concept, this water ballast chamber floods as soon as the hull settles off the plane, dragging the chines slightly deeper, lowering the boat’s centre of gravity and markedly increasing static stability. As soon as power is reapplied, a venturi effect comes into play, whisking all that ballast water out again through the aft intake and allowing the boat back onto the plane quickly and efficiently. Bar Crusher wasn’t the first to employ this system, nor is it the only manufacturer using it today, but there’s no doubt Bar Crusher’s designers have got things exactly right. Starting at the pointy end, you get a reasonable-sized cabin that will overnight a couple (you have to be friendly, mind you) in relative comfort. The cabin is lockable, with plenty of sub-berth storage and full interior carpeting to deaden noise and keep things a little warmer than bare aluminium. The cabin hatch, although rarely as significant as it once was in these times of electric drum-style winches, lets in plenty of light. It’s no frills fishing accommodation, but it all works pretty well. As mentioned, you’ll find a bit more room and definitely higher comfort levels in the Bar Crusher 730HT compared to the more traditional C version. Seating for driver and passenger is very comfortable, with both seats mounted on well-proportioned storage boxes. The test boat had been fitted with an optional Engel fridge/freezer mounted on an easy-to-use slide housed within the port-side seat locker – again, very handy and nicely located for easy access. On the opposite side, the locker directly beneath the helm seat eats up safety equipment, wet weather clothing and any other bulky items that need to be kept dry and ready for immediate use. Beneath the cockpit floor, positioned directly above the ballast chamber, you get a 330L fuel tank as standard, that will provide the sort of range most bluewater anglers are looking for. Directly aft of the tank is a handy fish bin that self drains and is ideal for storing the catch during a hot bite. The entire cockpit floor is checkerplate aluminium. It can be covered with rubber tube matting, if so desired. I like the Bar Crusher 730HT’s transom set up, which allows for dual engine installations, as tested, without compromising aft fishing space. There’s a simple fold-down aluminium seat directly below the padded transom coaming, which covers the batteries, oil bottles (if required, as is the case with two-stroke outboards) and power isolation system. A decent size live bait tank is set in the port transom corner, while to starboard you’ll find a walk-through gate with convenient slide-out panel. A berley bucket is included as standard, as is a sturdy fold-up boarding ladder. Like all Bar Crusher boats I’ve tested, the standard of welding, deck hardware, paint and general finish is outstanding. Bar Crusher director Peter Cleland runs a pretty tight ship in his Dandenong South factory, and I don’t hear too many complaints about workmanship or general construction. The market is way too competitive these days to turn out anything close to sub-standard, and Bar Crusher’s consistent national sales would suggest quality control is right up there. 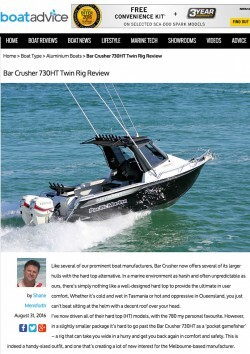 Outboards of between 200-250hp are recommended for the Bar Crusher 730HT, which seems just about right. Because of their reduced weight, Pacific Marine had installed a pair of 130hp Evinrude E-TECs, which although slightly above the maximum power ceiling, certainly didn’t appear excessive. Only time on the water would tell, of course. The combined weight of the E-TECs was 354kg, which is a fair bit more than a single Honda BF250 (272kg), but there’s no doubt the 730 hull has enough buoyancy aft to handle the extra weight. Confirming what I had suspected, the Bar Crusher 730HT sat at a healthy angle once it had been launched at Adelaide’s North Haven Marina. There was certainly no ‘bum-down’ attitude, as had been the case with the 780HT I had tested a couple of years ago with dual 150hp four-stroke outboards on the transom. This was definitely a case where the weight advantage of direct injected two-stroke engines provided a real bonus. Once outside the restricted speed zone, I dropped the hammers and blasted out onto St. Vincent’s Gulf. The acceleration provided by the twin Evinrude engines was really something else; I guess when you have that sort of torque working in your favour, the outcome is essentially a foregone conclusion. It was pretty flat as we powered toward the west, and we topped out at an impressive 40kt or 74km/h (GPS measured) at 5900rpm. With two props biting hard, I was able to pull the boat around into some pretty radical turns with absolutely no cavitation or loss of momentum. Mind you, there was a small amount of prop torque evident while turning against the direction of rotation, but certainly not enough to worry about. Unfortunately, there was insufficient sea running to provide an up-to-date rough-water performance assessment, but I’d be confident in saying this hull would behave precisely as its brethren and eat up the lumpy stuff with ease. I wouldn’t order this rig (or any other deep-V hull for that matter) without trim tabs fitted, as physics dictate that any hull with such a deep deadrise will always lean into a cross wind. This is further accentuated by the hard top, making trim tabs essential equipment. At rest, the Bar Crusher 730HT is wonderfully stable. As soon as that ballast chamber is full (it takes just a few seconds), the boat sits there like a rock, providing the ultimate offshore fishing platform. This is great when you’re drifting out on the blue water or maybe sitting on the pick at your favourite snapper ground. The Bar Crusher 730HT I tested came on one of Bar Crusher’s custom-designed dual-axle trailers. Up front was the Bar Catch™ system, which makes life easy for single-handed launches and retrieves. I powered the boat both off and back onto the trailer with no problem at all, made easier, of course, by the lack of any substantial cross wind. With an all-up highway towing weight of around 2250kg, I would recommend a mid-sized four-wheel-drive vehicle or larger SUV as best suited to the job. The 4WD option also provides a tad more security while retrieving on a slippery ramp when the tide is down. The Bar Crusher 730HT is certain to prove a real gem for Bar Crusher, appealing to the dedicated bluewater sportfishing market with its unquestioned performance and high build quality. It would definitely be my choice over the 730C, mainly due to greater functionality and user friendliness. It’s certainly not a budget buy when presented in the same form as the test boat, but I doubt you’ll find many trailer boats in its class that can compete on so many levels.